A series of unusual and threatening phenomena including volcanoes, radioactive waste, and a mysterious marine anomaly called ‘the Blob’ have all appeared in the waters of the Pacific Northwest in the last month. 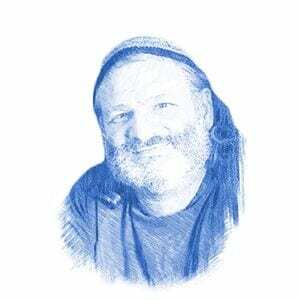 Something is brewing in the cold coastal waters, and though scientists are struggling to understand, one rabbi sees right through it all. Trouble bubbled up from the bowels of the earth last month as volcanic activity increased off the coast of Alaska. Bogoslof volcano, about 60 miles northwest of Dutch Harbor, erupted more than 37 times in the last three months, sending volcanic ash up to 30,000 feet. The eruptions are accompanied dramatically by violent lightning strikes.The volcano remains in a heightened state of unrest and could erupt again at any time. In the Bible, volcanoes and seismic activity are connected with God’s anger, especially in the context of the End of Days. 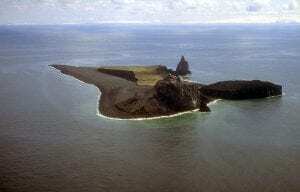 The Bogoslof volcano is one of the 160 active volcanoes in that section of the Pacific Ring of Fire, the world’s most seismically active region. This section also includes Mount St. Helens, which erupted cataclysmically in 1980, in the deadliest and most economically destructive volcanic event in the history of the United States. Though most of the volcanoes in the region are in relatively unpopulated areas, many of Alaska’s volcanoes are in the major trans-Pacific aviation lanes. Volcanic eruptions can shut down overhead air-traffic as the abrasive ash may cause jet engine failure and interfere with electronics. Science has made great advances, but volcanoes, along with the other phenomena that struck recently, bear the clear message that much of nature is beyond our control. Rabbi Yosef Berger, the rabbi of King David’s Tomb on Mount Zion, notes that this is a particularly relevant message in our era. As if volcanoes are not enough, meteorologists are gravely concerned about what they have called ‘the Blob’, an unusual lingering mass of warm water 310 miles off the Oregon coast. The Blob appeared in late 2014 and was welcomed by residents of the chilly Northwest, as it was linked to unusually warm and sunny weather. But a recently released study revealed that what first seemed like a blessing was actually a curse. Dan Jaffe, an atmospheric scientist at the University of Washington Bothell, reported last week in a study of the Blob in Geophysical Research Letters that record levels of ozone have been registered throughout the West Coast. He attributed the phenomenon to the unusual weather conditions caused by the warmer ocean temperatures by the Blob. “Ultimately, it all links back to the Blob, which was the most unusual meteorological event we’ve had in decades,” Jaffe said in an interview with UW Today, the news source for the University of Washington. 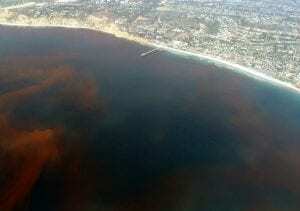 The Blob brought with it a disturbing Biblical phenomenon: the warm waters created some of the worst-ever toxic red tide algal blooms. As in the Biblical plague, the red tides led to massive numbers of marine mammals dying, as they are unable to find their cold-water food, normally plentiful in the Pacific Northwest. A third plague has also struck the region. It was announced last month that nuclear waste has finally made its way from Japan to the United States coastline. Officials revealed that Cesium-134 from the 2011 Fukushima nuclear disaster was detected off the coast of Oregon and has been found in seafood from that area. The list of problems grows, but scientists are coming up short in their search for answers. Biologists are still scratching their heads over a massive die-off of marine birds in Alaska last year. In a report released last month, Heather Renner, a supervisory wildlife biologist, told KTUU that the birds died from starvation, but they had no idea what brought this famine on. Renner inadvertently paraphrased the sentiments of Job, who warned that birds can serve as messengers bearing a divine message.